Tomlyn produces superior quality therapeutic skin and coat products and medications. These products are used and endorsed by professional organizations and Certified Master Groomers and have been setting the standard for high quality for over two decades. • Provides Relief To Hot Spots That Are Red, Oozing, Dry Or Flaky. • Promotes Hair Growth Where Hair Loss Occurred From Chewing and Licking The Hot Spot Area. • Temporarily Relieves Coughs Associated With A Stay In A Kennel and/Or Exposure To Other Animals. 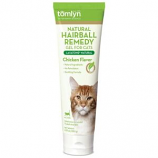 • Tuna Flavored Hairball Treatment and Prevention. • Used Daily To Prevent and Treat Hairballs. • Regular Use Coats Swallowed Hairballs and Allows Them To Pass This Problem. • Affects Cats Kittens and Longhaired Dogs. • White Petrolatum and Other Ingredients. • Nutrical For Ferrets Is A Highly Digestable Great Tasting Gel. • Ideal For Ferrets That Are Not Eating Regularly and Provides Additional Energy and Calories. • Place A Small Amount On Your Ferrets Nose Or Mouth. • To Supplement Your Pets Caloric Or Nutritional Intake. • Veterinarian Recommended Hairball Lubricant For The Prevention and Elimination Of Hairballs In Cats. • Maybe Used Daily As A Preventative. • Soothes Hot Spots and Insect Bites, Reduces Pain and Itching. • Helps Prevent Infection and Controls Scratching and Spot Chewing. • Foot Pad and Elbow Cream For Dry Cracked Pads, A Fast-Acting, Gentle and Natural Remedy. • Which Penetrates Into The Sublayers Of The Pad To Get At The Cause Of The Problem. • Place A Small Amount On Your Cats Nose To Stimulate Taste Interest. • Veterinarian Recommended High Calorie Dietary Supplement That Provides Quality Nutrition In A Great Tasting Gel. • If Puppie Is Not Eating Give 1/3 Tsp Per Pound Daily. • A Smooth Estrous Gel For The Prevention and Removal Of Hairballs In Cats and Kittens. • Regular Use Of Laxatone Coats The Swallowed Hair and Allows It To Easily Pass Through The Intestinal Tract. • Washes Away Dirt and Wax. • No Swabbing Of Ear Canalneeded. • Painless, Bubbling Action Ear Cleaner. • Broad Spectrum Disinfectant For Viral, Bacterial, Fungal Microrganisms. • Helps Create A Healthier Environment For You and Your Pet. • Works Rapidly & Is Effective On 99. 99% Of All Pathogens. • Allows For Maximum Penetration Of Dried, Crusted Debris. • Laxa-Stat Is A Palatable Laxative and Lubricant For Hair Ball Removal. • Is Easy and Safe To Use and Is Produced By The Same People Who Originally Developed Laxatone. • It Offers The Same Gentle Great Tasting Paste Your Cats Will Love. • Safe, Easy To Use Pre-Measured Tablets Of Trifecta Offer Added Convenience!